Rabbit Removal and Rabbit Control Services! 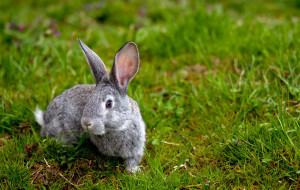 Rabbit Removal is a service provided by Hayman Wildlife Management throughout Stevensville, Benton Harbor, St. Joseph and surrounding areas in Michigan. A Rabbit problem typically starts out innocently with an occasional rabbit appearing in your garden or yard. Rabbits are curious but she animals that try to avoid human contact. The major issue with Rabbits is that they dig extensive tunnels in search for food. This can lead to weakening the soil around your shed or deck and can lead to the structure collapsing. There are several ways to get rid of rabbits from your property. Some choose the exclusion technique, which is basically putting a wire fence around your garden that doesn’t allow the rabbit to make its way in. The fence should be at an angle at the bottom so that the rabbit is unable to borrow underneath it. Rabbits are not as determined as other animals when it comes to finding food and will typically move on to another food source when it is unable to get through the fence. The most common way to get rid of a Rabbit is through trapping. The trap is set in the areas that the rabbit has been seen and a food bait is laid near the trap. The rabbit will take the bait and will be enclosed into the trap until it can be released. This is the most humane way to remove nuisance rabbits from your home. Hayman Wildlife Management is fully equipped and specially trained to handle rabbit removal and all other types of wildlife problems. Our wildlife experts are always prepared to tackle nuisance wildlife humanely and efficiently. Call us today at 269-588-0176 to schedule an inspection!